Your minimum guest guarantee should be realistic and lower than what you expect. Once you sign your contract, you agree to pay for all the guests on your minimum guarantee, even if less guests actually attend. So when a venue encourages you to set your minimum guarantee at a number which you are not likely to fall below, the venue is watching out for your budget. “When setting your guaranteed minimum number, it's wise to reduce your guest expectations by 10 percent, since there’s always a chance that people with kids won’t be able to find a sitter for that night, for example, or that someone will not be feeling well enough to attend. “Many properties say everything is included, but others might not mention that some items are extra. 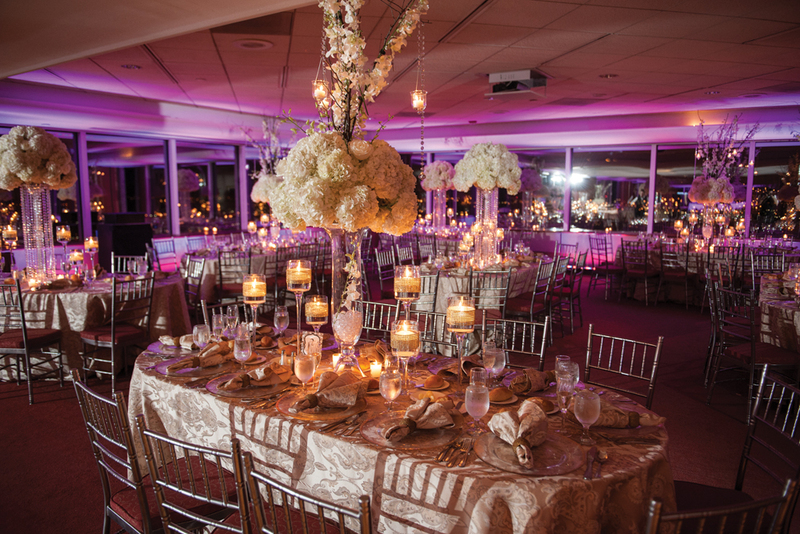 For example, do they give you Chiavari chairs, four or five types of special linens to choose from, and show plates in silver, gold, or bronze? Ask if the napkins that go with the linen are also included, though this will be an additional charge if you are renting linen. These are minor things, but when you’re having 200 people attend, rental costs can add up. “Many places also say they have valet parking available, but you may have to pay for it." So when you’ve chosen your venue, read the fine print in your contract to know what you are actually getting. At their New York Deli station their specialty drink was a highball of Doctor Brown’s cream soda with vanilla vodka on the rocks. The station included bite-size grilled reubens and mini sandwiches of hot pastrami with mustard on rye. “The line was longest at that station! We also had kosher beef hot dogs, sauerkraut, grilled onions, two kinds of knishes, classic cole slaw, and bagel chips. We couldn’t offer these sandwiches without a kosher dill pickle! “We know that the trend is farm-to-table, so we also created a Jersey Fresh Farm-to-Table station for this bride, and now we offer it to all our brides. 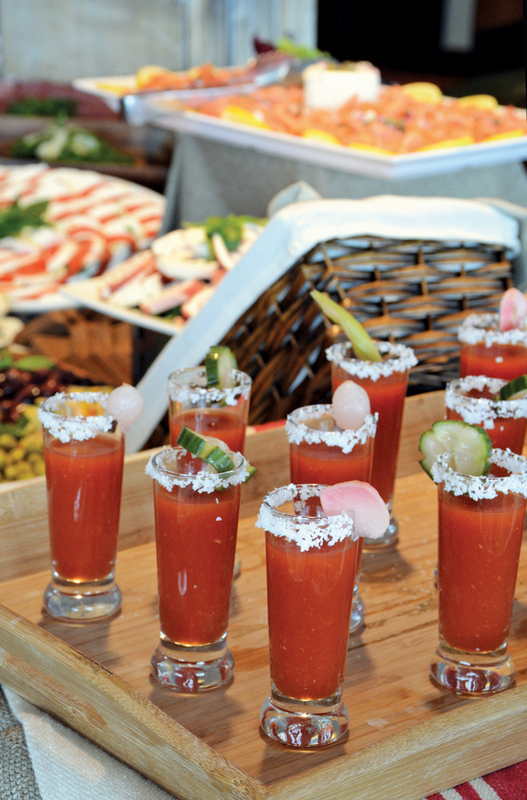 The specialty drink for farm-to-table is spicy Bloody Mary with homemade pickled vegetables. They also had a Down Home station. “The highlight was crispy chicken tenders with waffles and maple syrup.” The drink at that station was Jack Daniels spiked lemonade. The station also had Carolina pulled-pork sliders, lobster mac and cheese, and jalapeño cornbread. 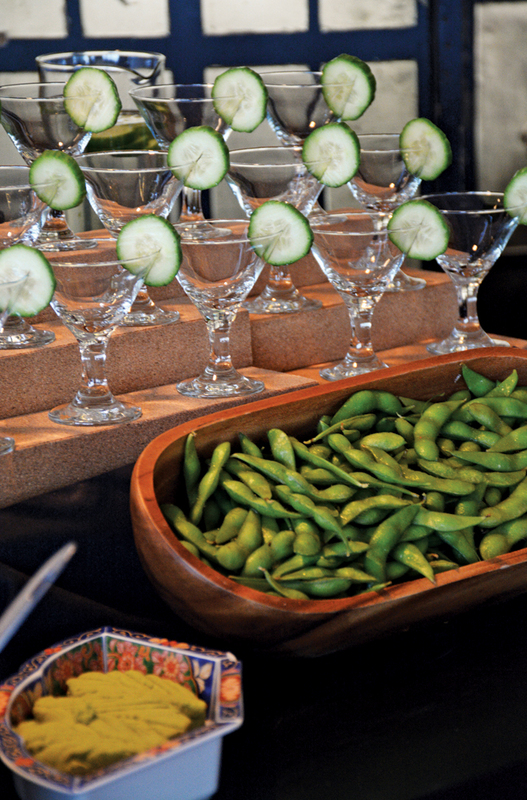 They also created a Taco Bar station for the couple, which included tequila grilled shrimp and tilapia, plus citrus cilantro grilled chicken and all the accompaniments: pico de gallo, black bean salsa, guacamole, and fresh baked crispy salted tortilla chips. One recent wedding had a black and white theme. “They used our silver show plates, gray napkins, and silver napkin rings, so many of their design needs were already addressed before they even started talking to their florist. “We also have a number of vases in inventory and this couple chose a clear, cylindrical glass vase. The bride proceeded to buy some peacock feathers that were black, white, gold, and silver. So as opposed to spending hundreds of dollars on each centerpiece, she used our clear cylinder vases and added peacock feathers to the vase. 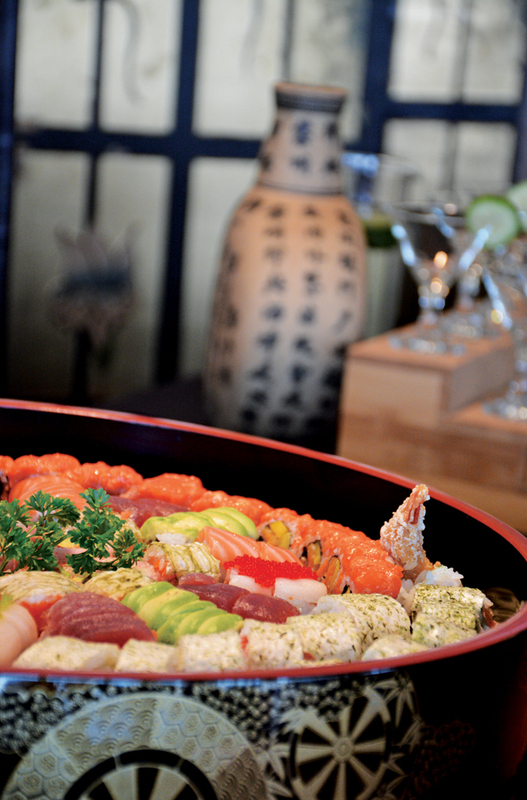 It was very dramatic and quite extravagant when coupled with all the other amenities and colors. Throw a couple of votive candles around the middle and there you have it, all under budget. 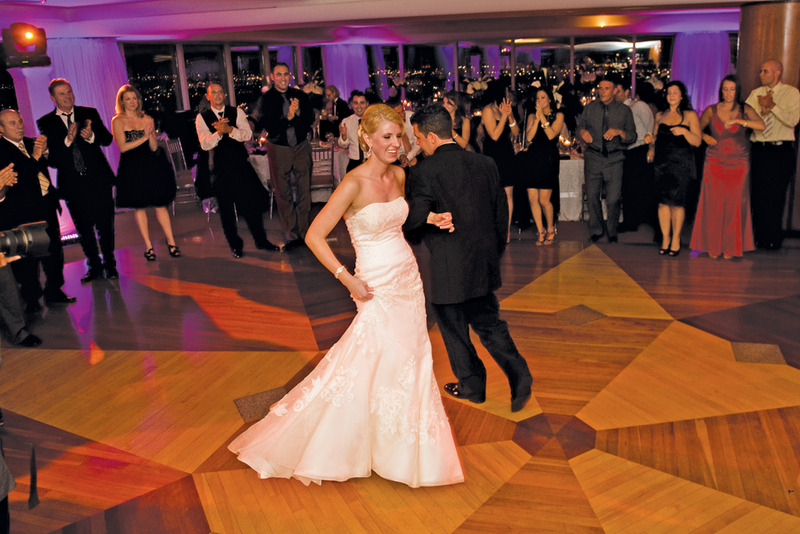 “Having worked at Windows on the World, with its sensational views, I became very aware that dressing up a traditional ballroom with four walls and no windows is much more challenging. 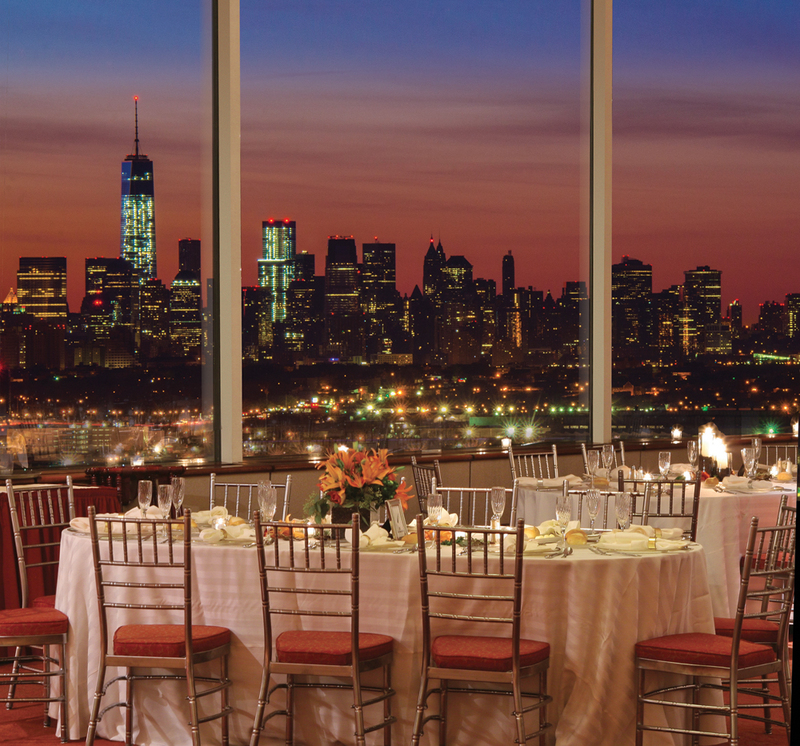 “When you have expansive windows like we do, and a backdrop of a beautiful view of the lower Manhattan landscape, a view that many of our brides are looking for, it takes some pressure out of overindulging in decorations.